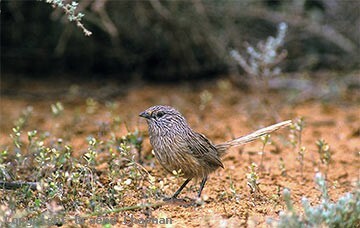 Western Grasswrens were first discovered by the French back in the early 1800's at Shark Bay in W.A. and that is still the best place to see them today. Sadly, the same can't be said for most of the other places where they used to occur. Originally, the range extended over a vast area of inland SW Australia and right across the Nullarbor Plain into South Australia. They were last seen on the Nullarbor in about 1909 and the last credible inland sighting in W.A. was made in the 1970's in saltbush country fringing Lake Johnston east of Hyden. They still persist at the eastern end of their range where the population around Iron Knob is now regarded as a subspecies A.t. myall (510203). What has caused the demise of such a wide-ranging species is open to question. Most of the original range has not been subject to intensive agriculture or clearing. 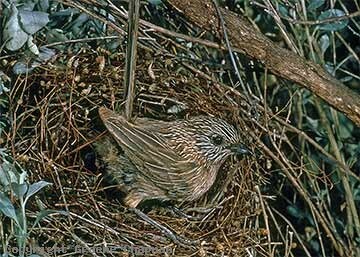 Western Grasswrens are ground feeders and in dry times when the ground was laid bare, both by rabbits and sheep, times would have been tough. Pics 510209 and 510210 graphically show what intensive grazing pressure can do to a chenopod shrubland during drought. Nothing to eat and nowhere to hide - death by starvation or predation. Thankfully we can still see Western Grasswrens fairly easily. 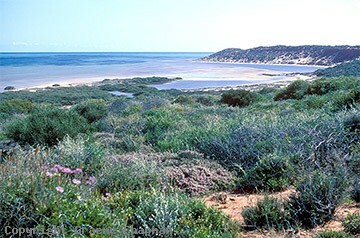 At Shark Bay, the road from Denham to Monkey Mia passes through good habitat, and at Monkey Mia itself, the birds are quite easy to find around the car park.There are also a couple of territories just outside the caravan park at Hamelin Pool. In South Australia, the road from Iron Knob to the Gawler Ranges also passes through a lot of suitable habitat (510206). You might even see a Redthroat there as well! 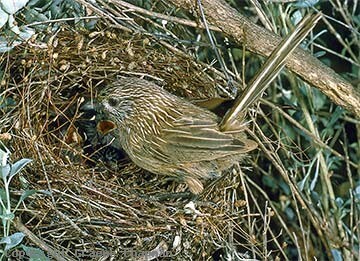 510101 ... Western Grasswren, Amytornis textilis textilis, male at nest, Peron Peninsula, W.A. 510203 ... Subspecies Amytornis textilis myall from S.A.